For a New Parent, Flower Girl, Birthdays Communion, Christening, or just make a little girl happy an item to cherish with our Engravable Baby ID Charm Bracelet. The stainless steel bracelet fits wrists up to 6 inches, and weighs just 3.5 grams making it comfortable for baby. The engravable face measures a half inch by a quarter inch, and is an ideal surface to engrave an infant's name, date of birth, or initials. 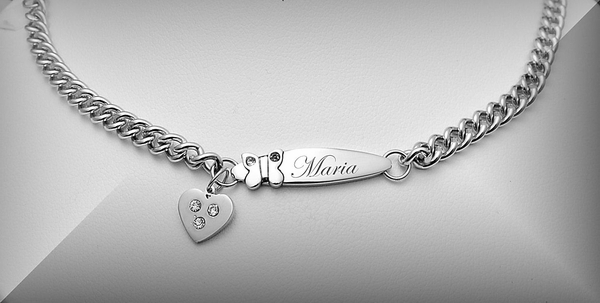 Commemorate life's most special event with our Engravable Baby ID Bangle bracelet!